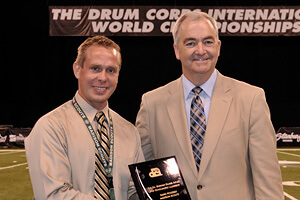 Dann Petersen (L) with DCI Executive Director Dan Acheson. In today's busy society, the logistics of leading a corps down the road is no easy task. But the drum corps activity lives on due to the hard work of thousands of passionate fans, supporters, volunteers and especially its leaders. Madison Scouts Director Dann Petersen was presented the 2010 Dr. Bernard Baggs Leadership Award at the DCI World Championship Finals on Saturday, Aug. 14. Named after the longtime judge and DCI Board of Directors advisor who passed away in 1998, the Baggs Award recognizes the outstanding director of the season as voted on by all World Class directors. Growing up with the corps, Petersen marched for a total of nine years as a member of the Madison Scouts and Junior Scouts, and was brought on board in 2008 to serve as corps director. Also previously a staff member, he's been involved with drum corps and other music-related activities for more than 22 years with various marching bands, winter guards, and winter drum lines around the world. "Dann was brought into the director role at a time when the organization desperately needed strong leadership with the corps on a day-to-day basis," said Madison Scouts Executive Director Chris Komnick. "He quickly established a sense of stability and renewed leadership with the young men we serve; he leads by example and leads through action. He has helped enable the foundation that has allowed the organization to grow and improve to what we have today." Petersen's work with the corps this season has been one large link in the chain to "re-establish the brand and identity" of the Madison Scouts, subsequently helping to propel the corps back into the World Championship Finals with its highest placement since 2006. Quick to point out those who have helped him get to where he is today, Petersen said: "Directors from every corps have helped me grow through guidance and advice over the past three years. This fraternity within DCI has been instrumental to my development as a director and has strengthened my desires to give back to the drum corps community. To be elected by those peers to receive this award is an incredible honor. I extend my gratitude to each of them for their part in this." Rick Odello with Blue Devils B corps members. The Open Class also awards its version of the Baggs Leadership Award to its outstanding director of the year. Blue Devils B's Rick Odello was chosen as recipient of the 2010 recognition after his corps completed a wildly successful run through the 2010 Drum Corps International Tour, winning its second consecutive World Championship title and a plethora of other honors. "It's a really humbling experience because this is voted on by your peers, so this is an award I really cherish and appreciate very much," Odello said. A 2008 inductee of the DCI Hall of Fame, Odello has been a part of the Blue Devils family since before its inception as a competing drum corps, when parents Tony and Ann founded the organization. As director of both the Blue Devils B and C corps, he has led by example and has been instrumental in the continued success of many corps as a member of the Open Class Advisory Committee. In praise of the 2010 Blue Devils B and other competing corps this season, Odello said, "We're just going to try to do things better every year. I'm really optimistic with the class of the other corps here, and I think the whole Open Class has really stepped up in 2010."